After I married my husband, he loved ham and I would buy a ham and then have the ham hock left with all the meat on it. He loved white bean soup, so I decided to try and make some for him. I did it several times through the years and I would always try and eat some but generally, I could only eat a few bites until the old taste-feelings (I think I coined a new phrase) would kick in and I could eat no more. This recipe is so good that not only did I eat a full bowl, I went back for seconds! Soak the dried beans in water for 24 hrs. or overnight, The beans will soak up the water so it may be necessary to add additional water thorough out the soaking time. Presoaking the beans reportedly helps to reduce the gassiness (is that a word?) of the beans. 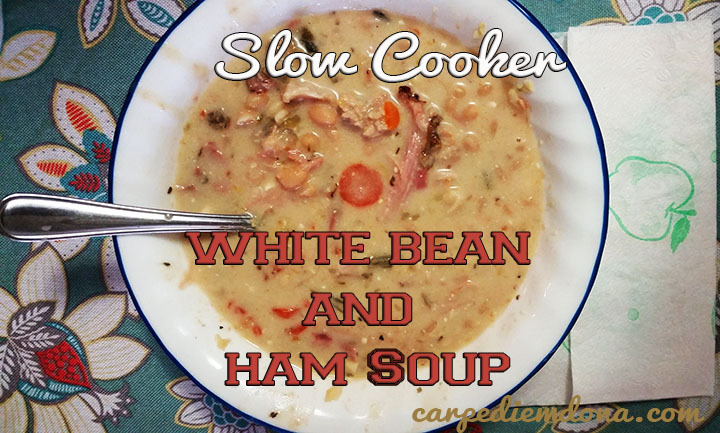 Add beans to slow cooker with ham hock and remaining ingredients. Stir to combine flavors and cook on low for 8 hours or high for 3-4 hrs. Cooking time will vary depending on the wattage of your cooker. When finished cooking, remove ham bones and shred ham, returning ham to the soup. Using a potato masher, mash some of the beans to thicken the soup. *To save time, you can substitute a 16 oz. can of white, navy or cannellini beans for the dried beans. If you want to know the difference between Great Northern White Beans, Navy Beans and Cannellini Beans, check out this website.